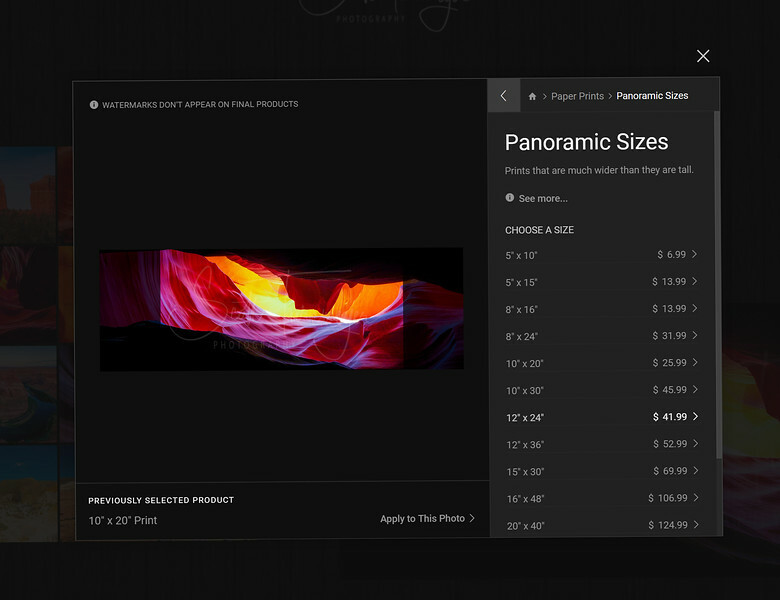 Ordering prints on this site is very easy. Below are step by step instructions on how to order prints, prints with foam backing (ready to hang and my preferred way to sell them), prints on metal (ready to hang), prints on acrylic (ready to hang, or prints with frames. If you still have any problems or questions, please contact us. 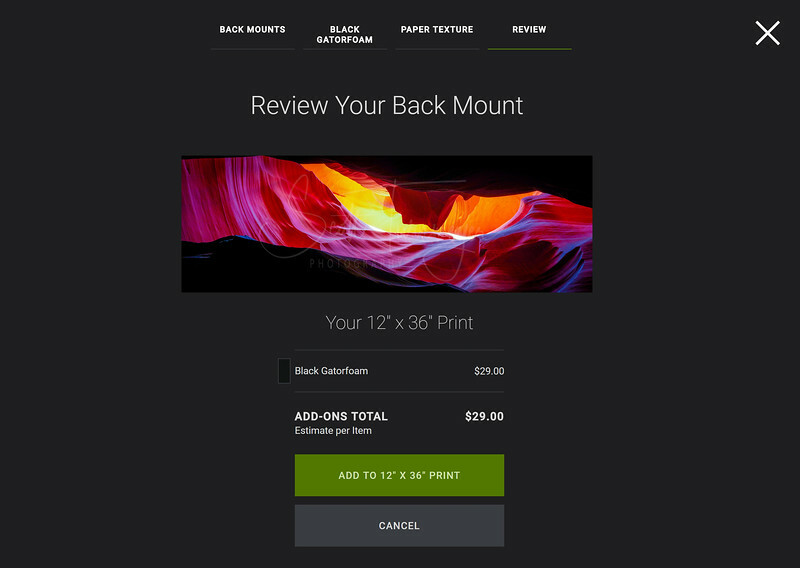 In this example we are going to purchase a panoramic print from Antelope Canyon and have it mounted on a black foam board and ready to hang. Find the photo that you wish to purchase and the the "Buy Photos" button in the top right. A drop down will show up where you will have the option of buying this photo, create a card or by multiple photos from this gallery. For this example we want to buy just this one photo, so we choose "This Photo". 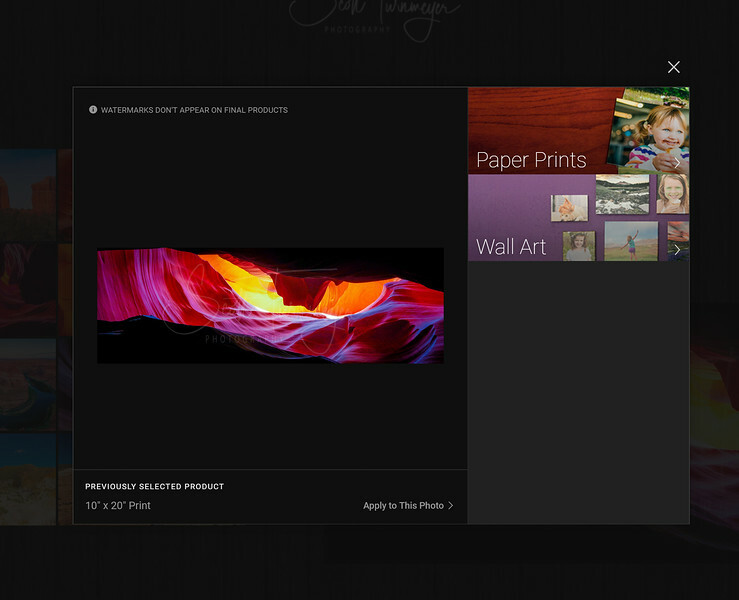 You will be asked if you want to purchase paper prints or wall art. If you would like to purchase metals or acrylics choose "Wall Art". 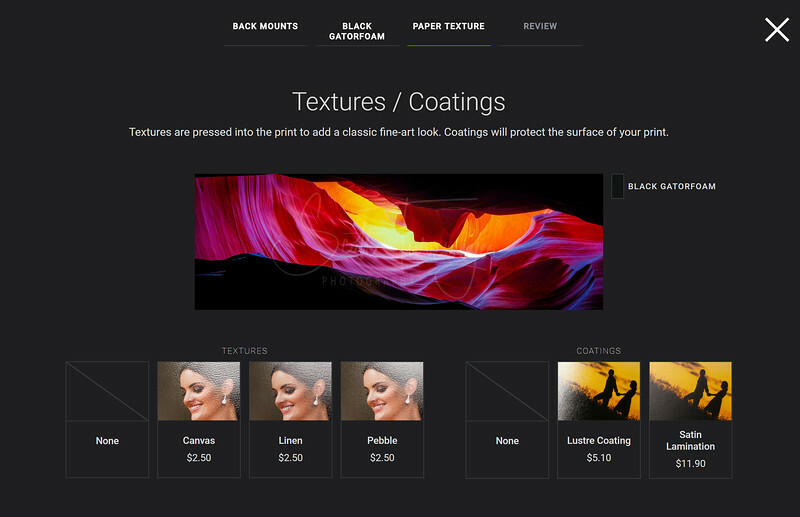 For paper prints, framed prints and prints mounted on foam board choose "Paper Prints". 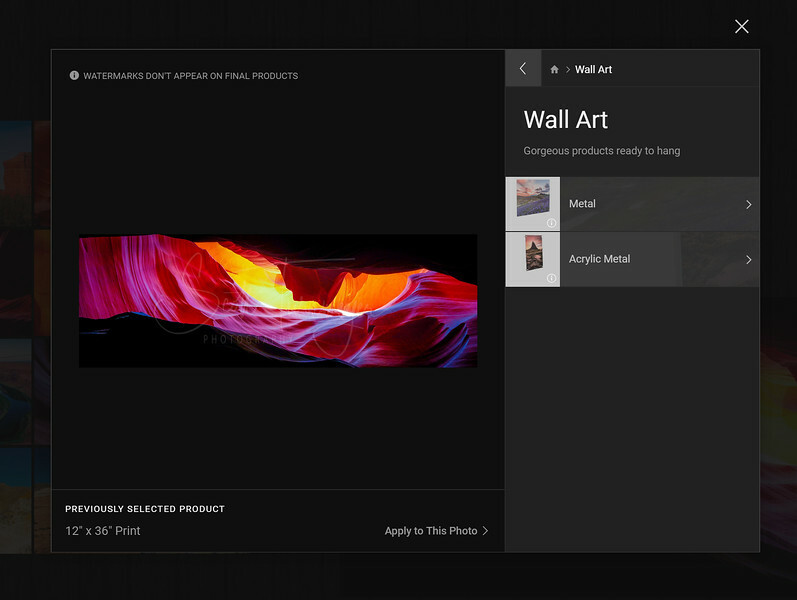 If you chose "Wall Art" you would then be asked if you want to purchase "Metals" or "Acrylic Metals". You would make your choice and follow the instructions to choose your size, etc. 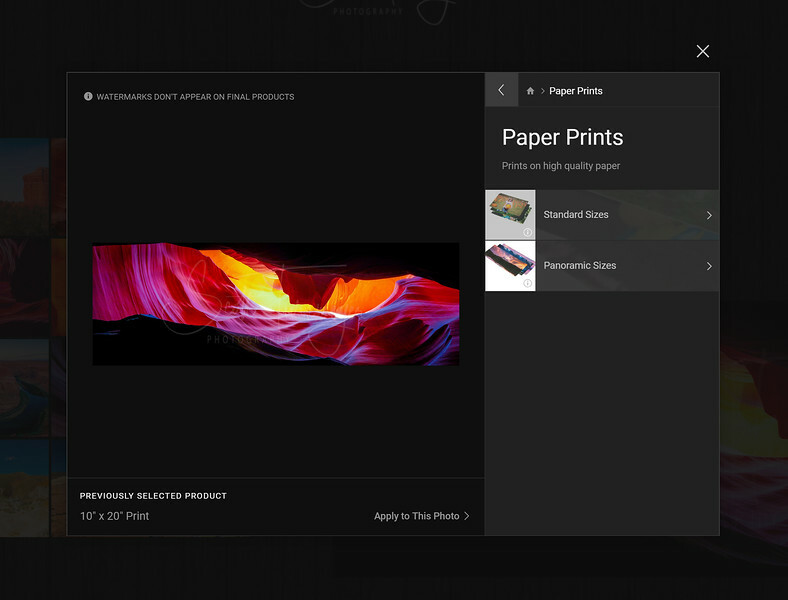 For our example we are going to back up and choose "Paper Prints" in the previous menu. Now that we have chosen "Paper Print", we are asked if we want a standard size or panoramic size. 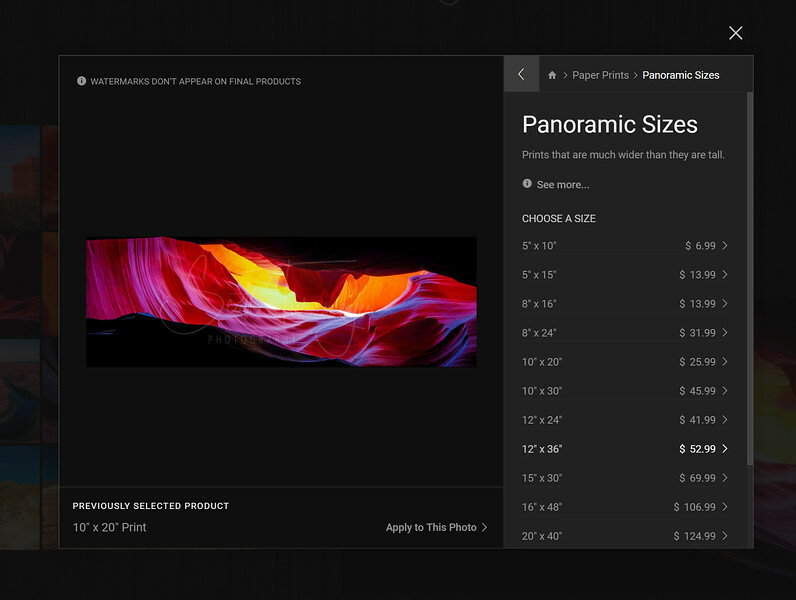 Standard sizes are more square-ish, like 16x20 or 30x40, where panoramic sizes are usually in a 1:2 or 1:3 ratio, like 12x24 or 30x90. Most of my prints are in panoramic format. Once you choose, you are then asked what size print you want. Pay very close attention to the sample on the left hand side as it will dynamically show you what your print will look like. Your print may be cut off without the correct sizing, as seen below. This is a 1:3 print, but I chose a 12x24 size, which is 1:2. You can see how some of the left and some of the right of the photo are cutoff. Now I chose a 1:3 ration, 12x36, and my photo on the left looks as it did in the gallery. This is what you want to see, the photo should like identical to how you saw it in my gallery. Once you select a size you are asked if you want to order more than one. Once complete here simply add it to your cart. 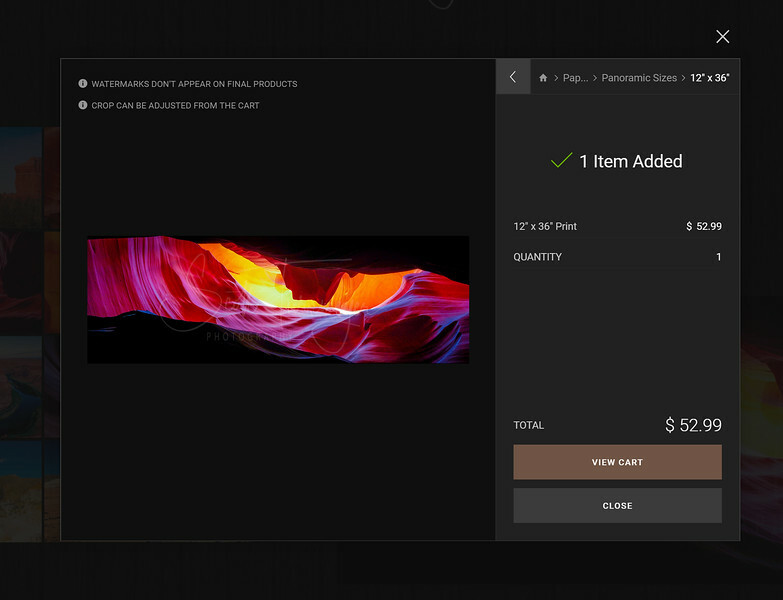 Once added to the cart, you have the option of viewing your cart or closing the window. Closing will take you back to the gallery where you can continue shopping. If you are done, as we are in our example, you would choose "View Cart". Now your shopping cart shows up. Not much different than any other online shopping cart. But wait, we wanted the foam board so its ready to hang, we were never asked about that. This is where you click the "Photo Add-Ons" button below your item(s). 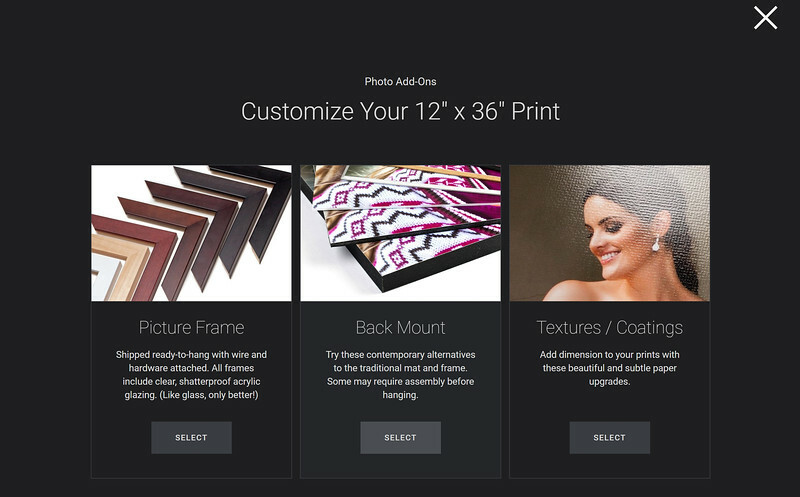 Here you can customize your print by adding a frame, a back mount and/or textures and coatings. 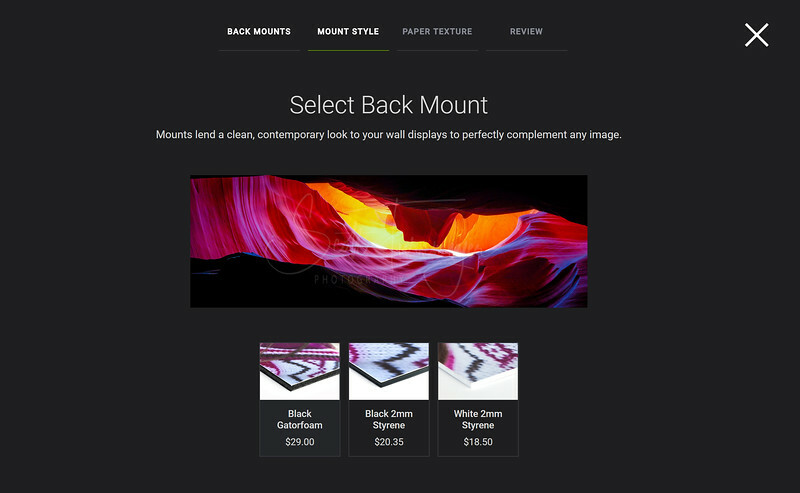 For our example we want to choose "Back Mount". Now we are given the Back Mounting options. 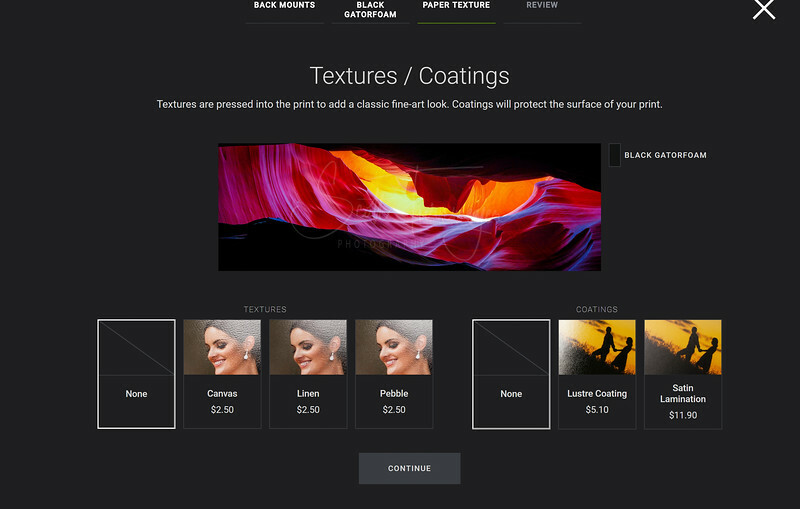 Each option shows you an example graphic of how it will look when it arrives. We want the thicker Black Gatorfoam for our example, so we'll choose that. Next we can choose and textures or coatings that we want for this print. Feel free to pick these if you wish, examples of what they do to the photo are given on this page. For our example we are going with no textures and no coatings. You must select one of each, but None and None are perfectly acceptable. Now you are brought to a confirmation page showing what selections you just picked and how much your add-on for this photo will be. 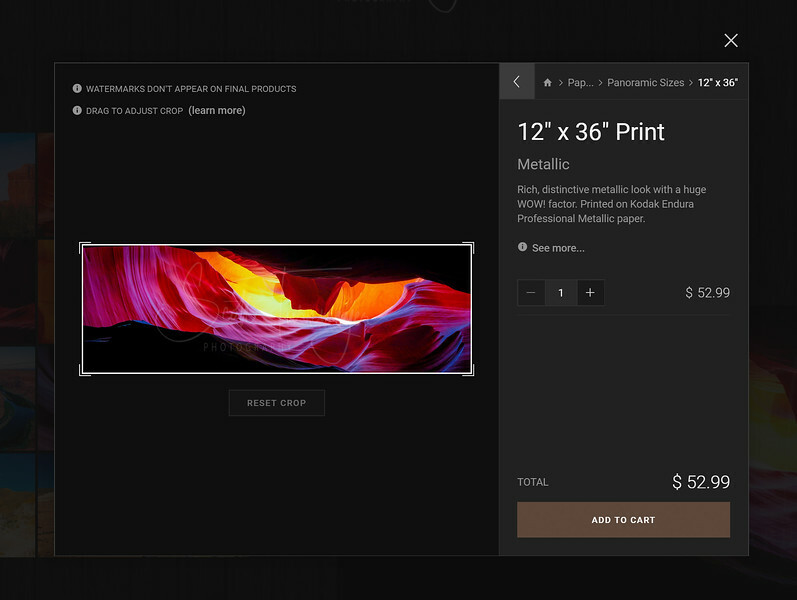 To complete the add-on click the "Add to xxxxxx Print" button, where xxxxxx with the size of the print that you chose (as seen in the example below of 12" x 36"). That's it. You are all done and ready to check out. Just click the "Begin Checkout" button to head through the standard checkout process. Your print order will then come to me for approval and then sent directly to my printer and shipped to you.